I thought I’d take a fun break and do some quickie photo shoots. Quickie because I maybe get 10 minutes to take these pictures before a living dolly comes along and knocks down the set-up or wants a snack. So here’s my RDP Angel. I’m taking baby steps in the customizing process with these dolls. I made the mistake of trying to open Velvet Minuet’s head and found it didn’t want to and I ended up doing some damage 😦 So I sent her off to the dolly doctor- Someone who knows all the little ins and outs of Blythe and the slightly different head molds and their individual challenges. So for now I’ll just sand matte and change chips or make-up. I plan to do more as I learn more. I just love the customs I see out there. So many possibilities that I have to learn about this and I’m up for the challenge. Now here’s Gaz my Sooni Dal. Ain’t she as cute as a button? 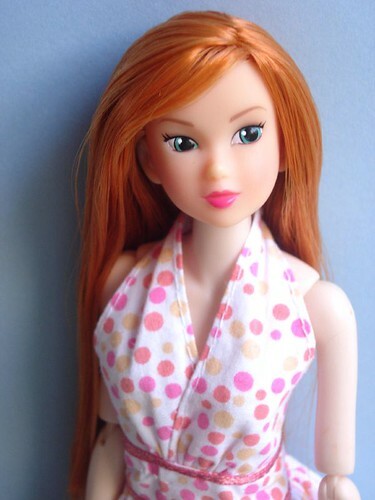 This series of dolls really remind me of my older daughter. The name Gaz is taken from the animated series Invader Zim. I saw some similarities between Dib’s little sister Gaz and this doll. Although Fiori’s hair matches Gaz hair color which is a purplely color. 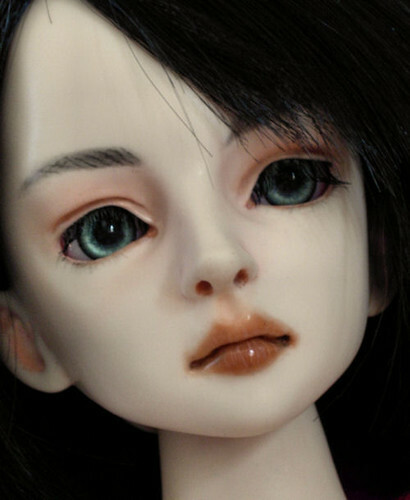 Now on to dolly projects, I just finished and listed an Obitsu Gretel head on eBay last night. I went for the natural fresh face or just woke up and rinsed my face look. Click here or on the picture to view or bid. Well it’s another Friday and time just doesn’t slow down does it. At least it’s a 3 day weekend for us here in the USA with Memorial day weekend. My momoko today is a rerooted commission of Miracle Party Girl. I love her new hair color. I was never wild about this dolls make-up but now it fits her perfectly. She still needs a fleshtone Sekiguchi body so please contact me if interested in selling one. I can then forward to the owner of this lovely head. She’s desperately searching for a body right now. I’ve been pretty busy with dolly projects with my new Blythe obsession and also just trying to get at least 3 customs listed on eBay a week. Here are my latest obitsu heads. One is a 1/6 size and the other is a Haruka 60cm head. Click here or on the picture to view or bid. 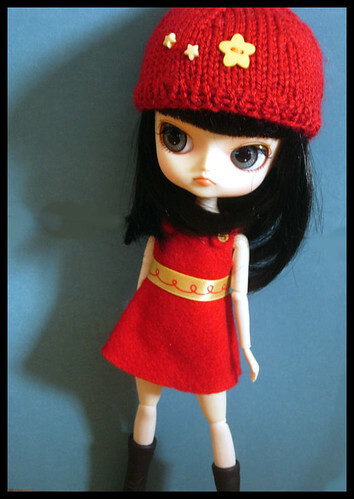 Well, I don’t have a momoko of the day today because I thought I’d share my first Blythe. She’s a Piccadilly Encore and I got her sort of as a Mother’s Day gift since my hubby and kids got me an eBay gift certificate. She arrived before my primadollies I ordered and I just couldn’t wait to customize her. All I meant to do was sand matted her face but accidently did her lips so I painted over them. I’m waiting on some eyechips too which really can make a difference. I may change out her eyelashes too but I don’t want to get a head of myself. Still love my momokos though so I’ll definetly have more pics of her soon. I’ll have to vary my daily pics between all these lovely dollies. I’m a little late in posting on my latest face-up. 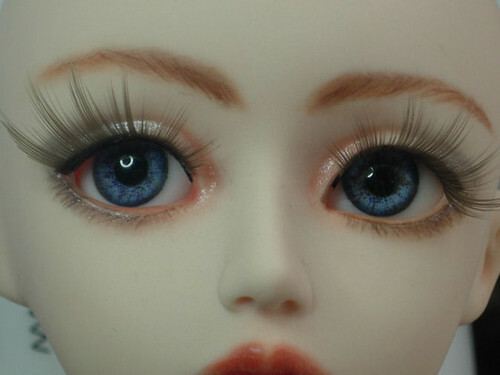 She’s a Volks dollfie head and she’s on eBay right now. I was busy with a visit from my mom last week so I haven’t had much time to get on the computer and have been playing catch-up. Click here or on the picture to view or bid. 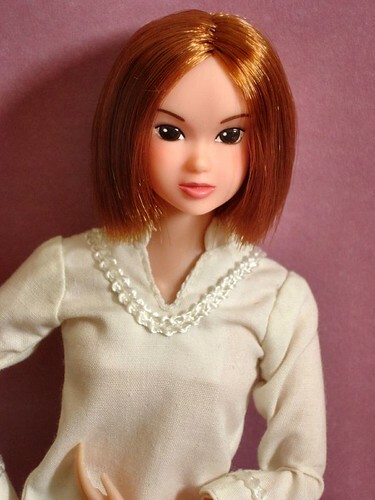 Poor Anika hasn’t had her picture taken in a while so she’s my momoko of the day. I hope all you moms out there had a wonderful mother’s day. I certainly did. My cute little girls gave me a card. I guess my older one who’s almost 4 dictated to daddy what was written in the card. It said “Thanks for loving me” SO CUTE! Or kawaii! 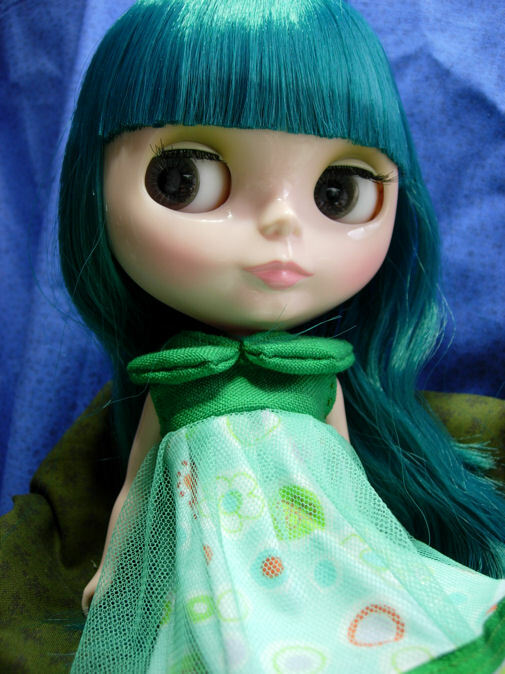 I also got an eBay gift certificate so I was able to get another Blythe- Piccadilly Encore. For now I’m enjoying all the Blythe pics at places like flickr. So many and boy do they get expensive! I’ll just stick with the newer less special ones for now. I look forward to tweaking on them. I have a new Obitsu Gretel head up on eBay tonight. Click here or on the picture to view or bid. My momoko today is the lovely 04HB from the 2004 petworks happy box. I got her in a trade and am totally pleased. She’s one that caught my eye but I just figured she was another one out of my reach so don’t even bother to want her. But now I have her. She’s a gem! On my dolly projects I do have a new 1/6 sized obitsu head up on eBay modeled on a sekiguchi body. She’s a white tone head with black hair and her photos don’t do her justice. Click here or on the picture to view or bid.